USS SKATE (SSN 578). Image courtesy Arctic Submarine Laboratory. 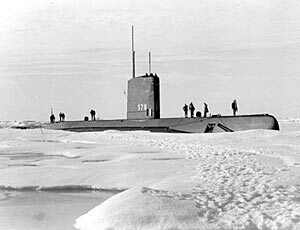 A US nuclear-powered submarine, also called Nautilus, passes under the North Pole, but does not surface, on its third attempt. The same year, the nuclear-powered submarine, Skate, became the first vessel to surface at the North Pole.